This sonification is a more thorough and, at the same time, a more artistic investigation of the translation of space onto time (cf. Wahlgesänge). Especially in the context of international comparative studies of social phenomena, space is a more prominent domension than time. The time dimension of sound thus can be used to display space. A common-sense metaphor for this translation is the journey. Traveling can be defined as moving through both time and space. While the time dimension as we experience it is unimpressed by the desires of the traveler, s/he can decide where to move in space. The art and science that has enabled mankind to find out where one is, and in which direction to go to arrive somewhere specific, is known as Navigation. Navigation as a practice and as a knowledge system has exerted major influence on the development of the world. The world has changed drastically by the consequences of the journeys led by explorers like Christopher Columbus or Vasco da Gama. The first successful circumnavigation of the globe, led by Ferdinand Magellan, proved beyond all scholastic doubts that the earth is in fact round. This would not have happened without the systematic cultivation of all the related sciences in the school for navigation, map-making and ship-building founded by Henry the Navigator, King of Portugal in the 15th century. 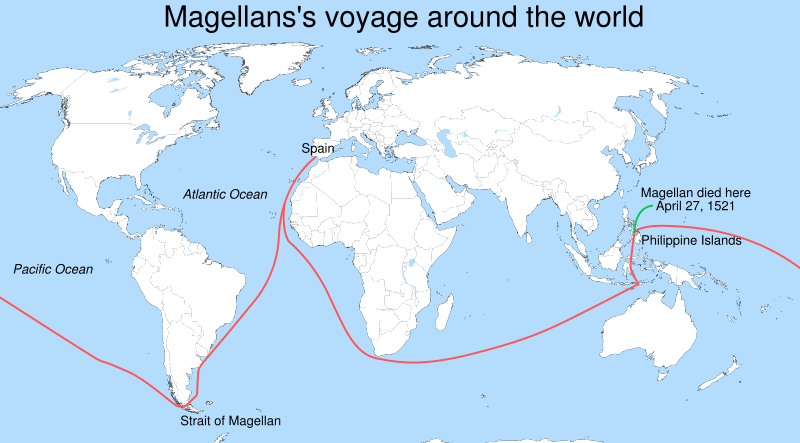 For all these reasons, Magellan's Route became an attractive choice for temporal and spatial organization of this work. By following Magellan's Route, it displays demographic characteristics of the nations it passes. Every country is represented by a complex sound stream composed of five resonators; all parameters of this sound stream are determined by (a) data properties of the associated country and (b) from the navigation process, i.e. the ship's current distance and direction towards this country. At any time, the 15 countries nearest to the route point are heard simultaneously. Here you can find a stereo version of the piece (mp3, 9MB!) and a detailed description (rtf) . de Campo, Alberto & Christian Dayé (2006): "Navegar é preciso, viver nao é preciso." Proceedings of the 12th International Conference on Auditory Display, London, UK, June 20-23, 2006.